Premium drain channel is 84 mm wide, while it comes with included Pure tile able grate, which is 12 mm deep and 64 mm wide, grate is 994 mm long and total drain length with insulation flange is 1060mm. Slot drain should be filled with tiles, so at the end of the day only visible part of the drain should be the channel which water flows through. Sealing membrane is a blue non-woven fabric which bonds well in the glue and is resistant to cracking. Premium drain channel is 84 mm wide, while it comes with included Pure tile able grate, which is 12 mm deep and 64 mm wide, grate is 1204 mm long and total drain length with insulation flange is 1260mm. Slot drain should be filled with tiles, so at the end of the day only visible part of the drain should be the channel which water flows through. Sealing membrane is a blue non-woven fabric which bonds well in the glue and is resistant to cracking. Premium Slim drain channel is 58 mm wide and comes with included Ponente grate type. It is plain stainless steel bar without any holes, only channels aside. That's the only visible part after the installation is completed. Frame is 12 mm high so is maximum thickness for finish material plus adhesive. Modern and convenient design with practicality for everyday use item. Total width with insulating flange is 96 mm and total unit length 540 mm. Wet room drains Invisible have included grate 80 mm wide and total width with flange is 140 mm. Cover is 594 mm long and drain 660 mm long in total. It should be covered entirely with floor finish material, best if it's edges could be properly adapted to leave sufficient amount of space for gaps for water to flow. Fabric for cleaning purposes before sticking finish material to cover is included. is stainless steel shower gully without vertical frame, which gives it flexibility to be installed under any finish material. It is most commonly used to be in vinyl, marble, stone, exotic wood or glass floorings. Entire drain including the grating should be covered with your finish material so only channels for water to flow are visible after installation. Invisible Slim is more advanced than Invisible, it has lower installation height and higher capacity. Wet room drains Invisible have included grate 52 mm wide and total width with flange is 92 mm. Cover is 594 mm long and drain 660 mm long in total. It should be covered entirely with floor finish material, best if it's edges could be properly adapted to leave sufficient amount of space for gaps for water to flow. Fabric for cleaning purposes before sticking finish material to cover is included. Sufficient siphon trap Smart Trap made of stainless steel is welded to the drain, fixed position and 40 mm long outlet positioned perpendicular to channel. Waste trap has 30 mm water seal which prevents odours from returning to your wet room. Pipe diameter is 40 mm and we include adapter which allows 50 mm waste pipes to be connected to it. Fast flow rate of 38 l/min makes it suitable for wet room with even big shower heads. 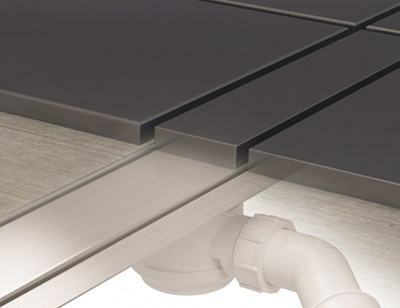 Linear drain Elite is 48 mm wide and it has included Pure slot grate which is 38 mm wide. Tileable grate depth is 12 mm, so tiles should not be thicker than 10 mm. After tiling is completed only visible part of the drain is gap between the grate and rest of the floor, which allows water to flow. Total width with insulating flange is 96 mm and total unit length 640 mm. Linear drain Easy Drain 800 mm Modulo TAF Zero-tile EASY DRAIN Easy Drain Modulo TAF, the perfect solutions for all your bathroom wishes. The subtle stainless frame provides an elegant look and fits seamlessly into your bathroom floor. Furthermore, the revolutionary TAF-technology and Water Protection System guarantee easy installation and a waterproof finish. Wall Upstand drain channel is 84 mm wide and it comes with included Mistral stainless steel grate. Mistral pattern features a regularly placed circles of various size along the entire grate, which is 64 mm wide and 494 mm long and total drain length with insulation flange is 560mm. Sealing membrane is a blue non-woven fabric which bonds well in the glue and is resistant to cracking. Chat started. Session ID: 1556250063. You are now connected to: David M.